Electronic pump controllers designed for a trouble-free operation and no maintenance. Fully integrated motor protection, including dry running and automatic reset. Available for single or multiple pump control. Full range up to 16 A single phase supply and PN10. Easy set up and parameters display. In-line flow to reduce the pressure losses (HC1) and simple connection for HC2 and HC3. HC1 can be useful for booster sets and any control of a surface or submersible pump for irrigation, water supply, cleaning purposes, filing elevated tanks or constant pressure boosting. 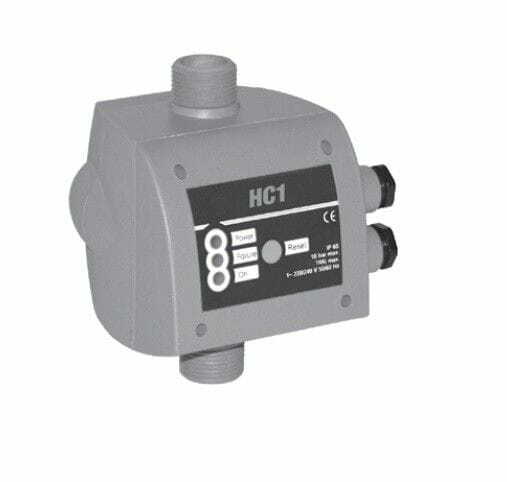 HC2 is an electronic pressure switch available for any application to mange 1 or 2 synchronized pumps in cascade mode and alternated sequence operation. HC3 have the same function for 1 pump.